I will be out of the office for all of this week on a 'long-overdue' vacation. I won't access to my email accounts until 6th February ! I've just confirmed my presence at AJAXWorld Conference. 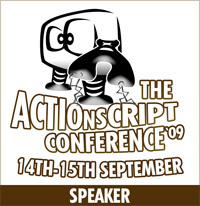 It will be a cool event with a lot of speakers and tracks. 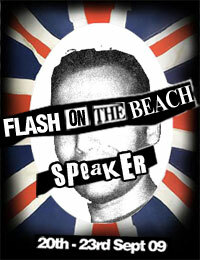 Now I have to decide , from the six tracks, what sessions to attend and it won't be easy ! Adobe wants to create a Customer Advisory Board (CAB) that would validate the Flex 3.0 features, so it's conducting a survey. Selected respondents for the private panel will have the opportunity to provide feedback on future versions of Adobe Flex and test early releases of Adobe software. In appreciation, all active participants will be eligible to receive a complimentary license of an Adobe desktop product. Today FlexGala User Group planned the 4th user group meeting event. FlexGala invited Igor Costa, Flex (Instructor, Evangelist and Developer) for an Adobe Network Solution company in Brazil, that will present for the italian user group. - Real-world Flex with AMFPHP showing a Bookstore example. The event will be online and free for all. Tomorrow I'll be at the Adobe booth during the presentation of Acrobat 8 for the italian market. I'll reply to Acrobat Connect's question and I'll show some Acrobat 8 new features. In this occasion we'll have the third Acrobat User Group meeting. Flash Media Encoder seams to be the reply to many clients of mine. Some guys are been testing it live right now ! FlexGala, the italian Flex User Group, today we planned a online meeting event where Ivan Baldassi, Coldfusion Developer and contributor for CFMentor (the Coldfusion User Group in Italy) will present and show how to create an Address Book application using Coldfusion Components and Webservices. Then we'll create the user interface in Flex 2 connecting to the webservice with the WebService RPC class. Adobe has released the final version of Flash Player 9 for Linux. You can download this version on Adobe Flash Player page. Adobe Flash Player 9 for Linux supports the same major features and functionality as the Windows and Macintosh versions for playback of Flash content and applications. Unsupported features include Express Install and auto-update notification, which are not available due to the variety of Linux platforms, each handling the Adobe Flash Player plug-in installation in different ways. The full-screen viewing feature is not yet available but is expected to be available in a release later this year. 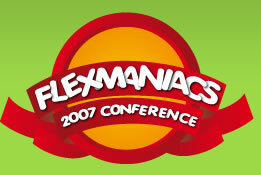 Another Flex conference in town : FlexManiacs 2007 ! Oh my God ... I love Flex and I love conferences. But explain me how to choose ! Anyway, the FlexManiacs 2007 with two full days of 60 minute lectures and 90 minute HANDS-ON practice sessions dedicated to Flex 2 and developing Rich Internet Applications (RIA), you're sure to get all of the information you need.